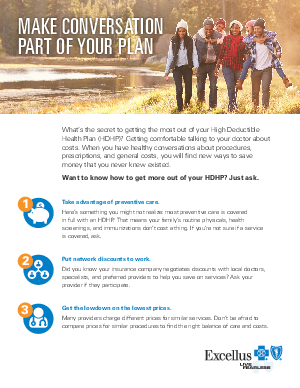 What’s the secret to getting the most out of your High Deductible Health Plan (HDHP)? Getting comfortable talking to your doctor about costs. When you have healthy conversations about procedures, prescriptions, and general costs, you will find new ways to save money that you never knew existed. Want to know how to get more out of your HDHP? Just ask.